A fully electric-powered version of the standard Mack LR model (above) will be on the road soon. "Mack looks forward to partnering with Republic Services to test the benefits a fully electric LR can offer in its day-to-day operations," said Jonathan Randall, Mack Trucks senior vice president of North American sales and marketing. "As a leader in refuse and alternative solutions, Mack is uniquely positioned to offer a proprietary, integrated and fully electric solution for North America." 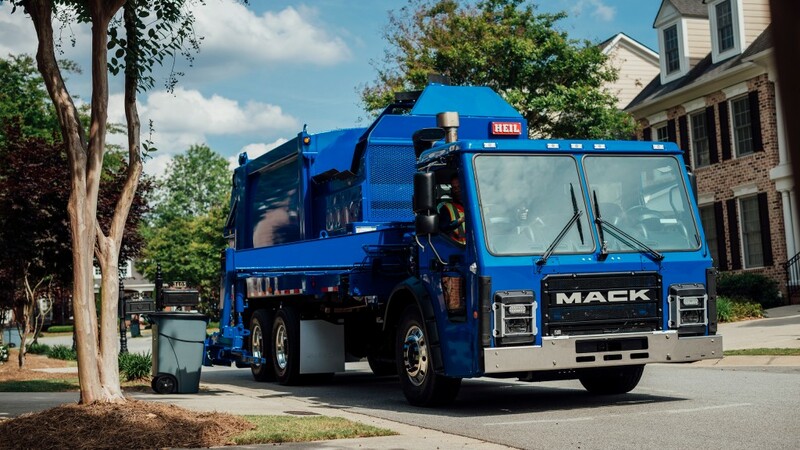 At this point in the development of electromobility technology and infrastructure, Mack believes that a fully electric vehicle will work best in a closed loop application in which the truck returns home every night - such as in the refuse industry. "Given we operate one of the largest vocational fleets in the U.S., we are continuously evaluating innovative approaches and technologies to improve the performance, economics and environmental impact of our fleet," said Don Slager, president and CEO of Republic Services. "We are excited to be working with Mack in the development of an electric garbage truck as it would represent a significant step towards a cleaner, safer and more efficient fleet while helping to preserve our Blue Planet for future generations." Mack announced in early 2018 that the New York City Department of Sanitation (DSNY), one of Mack's largest customers, also will test a fully electric Mack LR model, which will be operational in 2019. Those specs and details will also be announced at a later date.